One of our readers brought the ANTBIKE universe to our attention and thanks for that. The A.N.T. 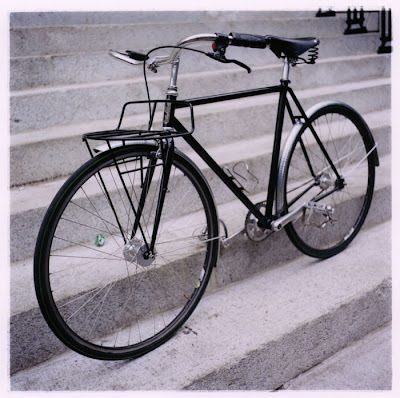 Bike [ANT meaning 'Alternative Needs Transportation'] is a labour of love by a passionate chap named Mike Flanigan and his partner Betsy Eckel Scola in a town called Holliston, Massachusetts, USA. Hand crafted bikes with each their own personality. Organic metallic wonders that are designed for style and function. As Danes, with a long history of design, those two words are music to our ears and the bikes we've seen on the website are operas for our eyes. They target the needs of the city cyclist and create bikes that suit the individual. "We not only hope to meet the needs of people's commuter bikes, but to influence the consumers to think about bicycle commuting in a more positive way. We love all types of cycling but feel that there is a real need to bring to the table bikes that have the right combination of style and function that is so lacking in the market." While we lament the fact that we have never ridden an ANTBIKE let alone stroked our fingers over the frame of one, we are quite convinced that they exude bespoke coolness. From what we gather there is quite a waiting list for one of these beauties, so get your deposit paid and settle back to enjoy the anticipation. 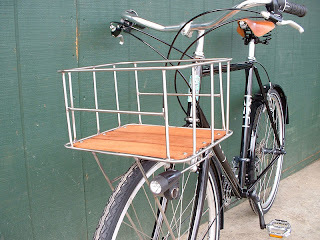 Not only that, ANTBIKE's do baskets and racks that are just plain fine. With the dollar as low as it is at the moment, Europeans would be well advised to act quicksmart in order to get their hands on some gear. One little detail that tickles us pink is the hand-crafted logo. It's just leapt to the top of our unofficial list of coolest bike logos. Ever ever ever. It's an ant. It's an A and a N and a T. And it is just as rusty as most bikes in Copenhagen. We want a large one for our wall. All in all we're thrilled to have made ANTBIKE's acquaintence. We love the fact that such bikes are being made 'Over There', and with such passion and dedication.